Herman and Clara (Vogel) Specht platted the Clara Townsite in 1886, and the community rapidly swelled with German immigrants. The Rev. 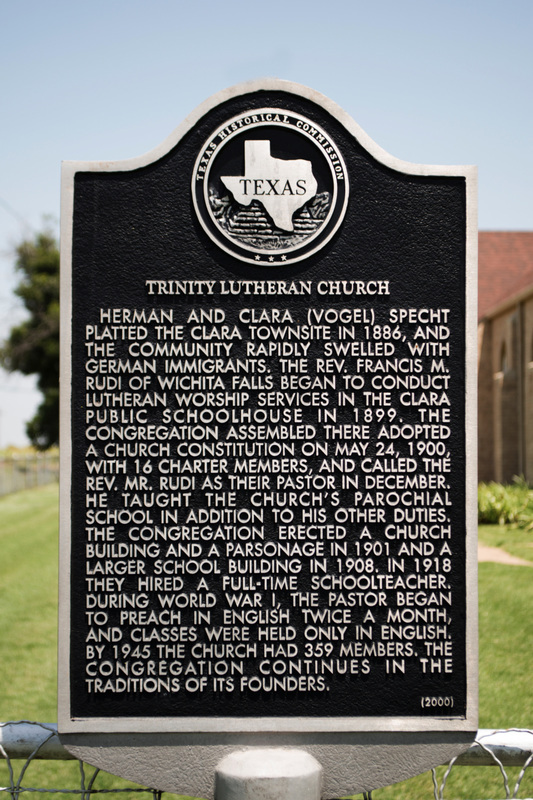 Francis M. Rudi of Wichita Falls began to conduct Lutheran worship services in the Clara Public Schoolhouse in 1899. The congregation assembled there adopted a church constitution on May 24, 1900, with 16 charter members, and called the Rev. Mr. Rudi as their pastor in December. He taught the church's parochial school in addition to his other duties. The congregation erected a church building and a parsonage in 1901 and a larger school building in 1908. In 1918 they hired a full-time schoolteacher. During World War I, the pastor began to preach in English twice a month, and classes were held only in English. By 1945 the church had 359 members. The congregation continues in the traditions of its founders. 11867 FM 1813 Iowa Park Texas 76367, located on SH 240 and Highway 1813, seven miles west of Burkburnett, Texas. GPS: 34-degrees 05' 18.7" -98-degrees 41' 55.6".